The other day we told you about a PR piece from Fox 5 news featuring Sarah Feldberg of Las Vegas Weekly. Turns out….once the magazine and the online addition appeared…. that it’s a whole “Downtown Edition”. Who are some artists I should know? I concur! And there’s a whole lot more that didn’t get mentioned. What’s There To Do Downtown? (I thought this was all there was going to be based on the Fox5 piece) It’s an embedded google map of everything downtown. I’ve embedded it below, or you can see it at Las Vegas Weekly. What Can I Do On A Saturday Downtown? An excellent itinerary. Can A Suburbanite Feel Welcome? Too bad he missed the best parts, and the biggest smiles. How Dangerous Is It – Really? Not at all if you’re not venturing off the well beaten path. What Should I Know Before I Go? A poetic group of recommendations from some of Downtown’s finest folk. What’s Up With Neonopolis? They neglected to mention the Southern Nevada Museum of Fine Art which is, granted, one of the only other tenant. The current exhibit of International Artists is wonderful, and should not be missed. What’s on The Drawing Board? With no mention of the Smith Center For The Performing Arts, The Ace Transit System, A new City Hall, and New Transit Terminal and a few others. 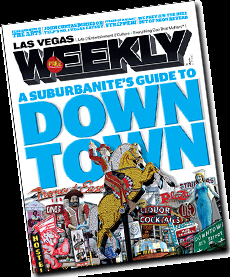 Overall….an upbeat and enthusiastic overview of Downtown Las Vegas. Too bad they didn’t mention the TERRIFIC HISTORIC NEIGHBORHOODS and Mid Century Modern homes that surround downtown. But that’s my job, so I’ll forgive them.